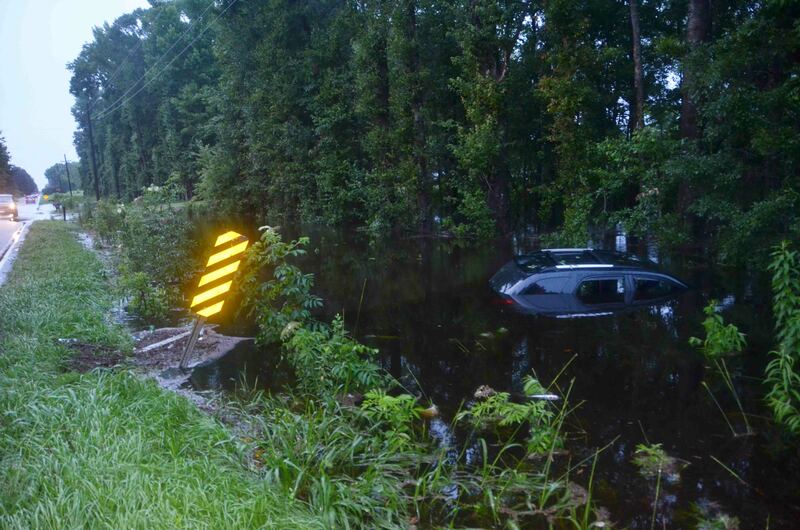 A small southbound SUV lost control in the 4400 block of Green Pond Highway near Catawba Hill Court and crashed into a deep drainage ditch submerging most of the vehicle. A 51 year old female and 9 year old female were inside the car. Torrential rains had just passed through the area causing flooding in several areas of the county. A flash flood warning was in effect. Click here for additional information. A 35 year old woman escaped with only minor injuries following a single vehicle high speed MVC on I-95 near the 56 mile marker northbound. 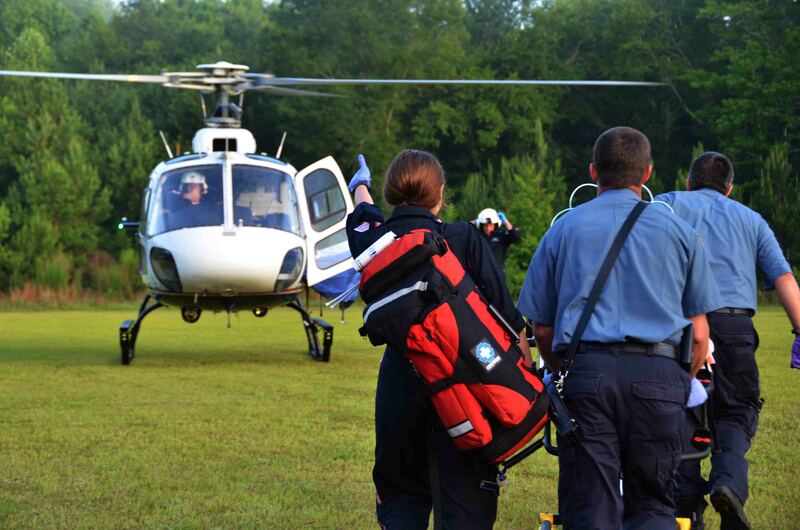 The incident occurred Sunday afternoon 30-June during a thunderstorm. At 14:10 the northbound vehicle lost control, spun around backwards and struck several trees in the median. The car came to rest on its side trapping the driver inside the vehicle. Click here for more info. A 20 year old Round O man received a non-life threatening gunshot wound to the right arm Sunday morning 30-June. The incident occurred at 189 Beach Road, the Druid Hills II Apartment complex and was reported to 9-1-1 at 00:41. Sheriff’s Deputies had the victim and several suspects detained in the parking lot of the complex. Click here for additional information. 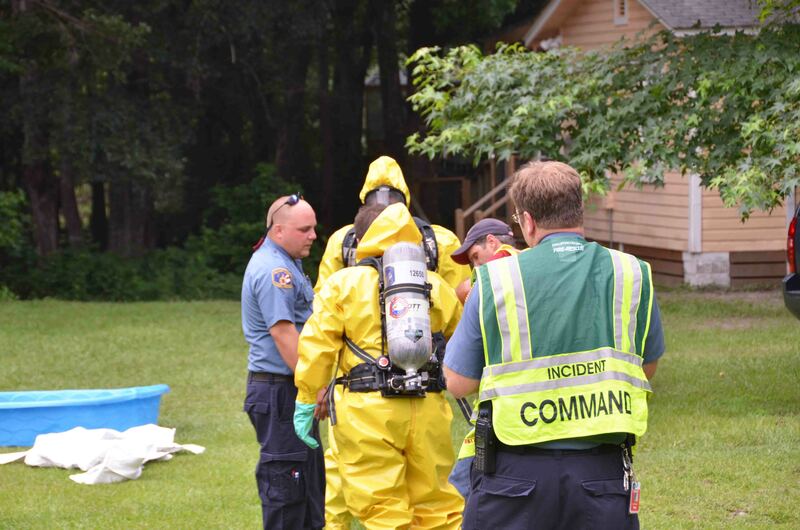 Law Enforcement requested a HazMat response to decontaminate two persons who were in custody and suspected to have been around the poisonous materials of a Meth Lab. 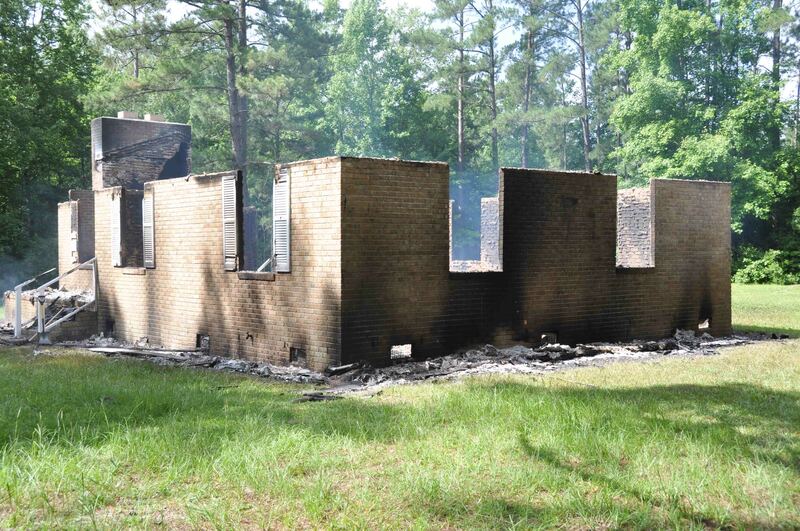 The incident occurred at 3717 Cannon Road Saturday afternoon 29-June at 15:00. A short decon line was established in the yard next to the residence. Click here for additional information. We wish to congratulate Firefighter-EMT Jonathan Ballinger and his wife on the birth of their daughter Annsley Grace who was born Wednesday , 26-June at 08:52. Annsley was a few weeks early, but weighed in at 5 pounds, 12 ounces. She and mom are doing fine and expect to go home tomorrow. Click here to view information regarding the next Red Cross Blood Drive honoring Firefighter/Paramedic Jordan Eaddy. At 09:38, Firefighters were sent to a residence located at 2135 Logan Farm Road for a reported structure fire. Engine 26 arrived minutes later to the remote rural area to find the single story dwelling completely destroyed and almost burned out. A neighbor driving past the home spotted the smoking remains and called 9-1-1. Click here for additional information. A 31 year old Georgia man received multiple traumatic injuries after his small SUV collided with a tractor trailer on ACE Basin Parkway near Stocks Creek Road Monday morning 24-June. At 09:32, Fire-Rescue was notified of the accident. The southbound GMC Envoy apparently crossed the centerline. 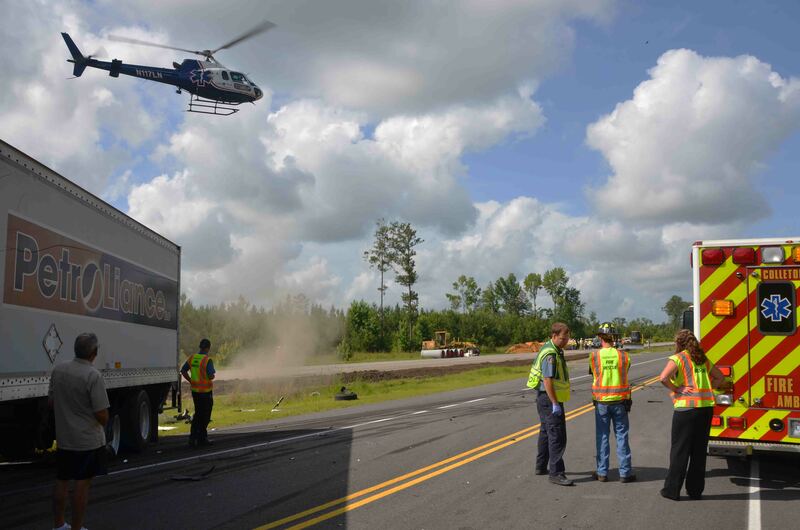 The northbound tractor trailer truck took an evasive maneuver to avoid a head-on crash,... click here for more info. A 30 year old Smoaks man received life threatening injuries in a high speed, single car MVC that occurred in the 200 block of Sizemore Road in the Johnsville Community. The accident was reported at 05:56, Sunday morning 23-June. The eastbound car lost control in a curve, spun around backwards before entering the woods on the westbound side of the road and struck several trees. Click here for more information. 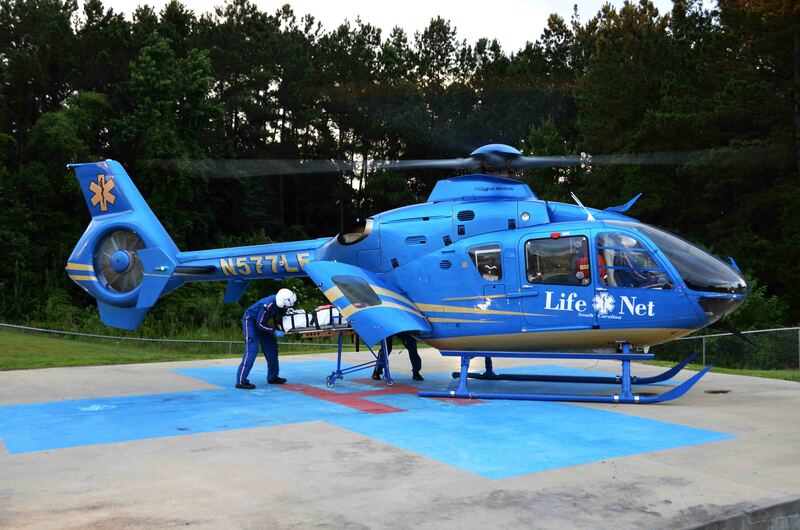 A high speed single car MVC resulted in two patients being flown to a Trauma Center Saturday evening 22-June. 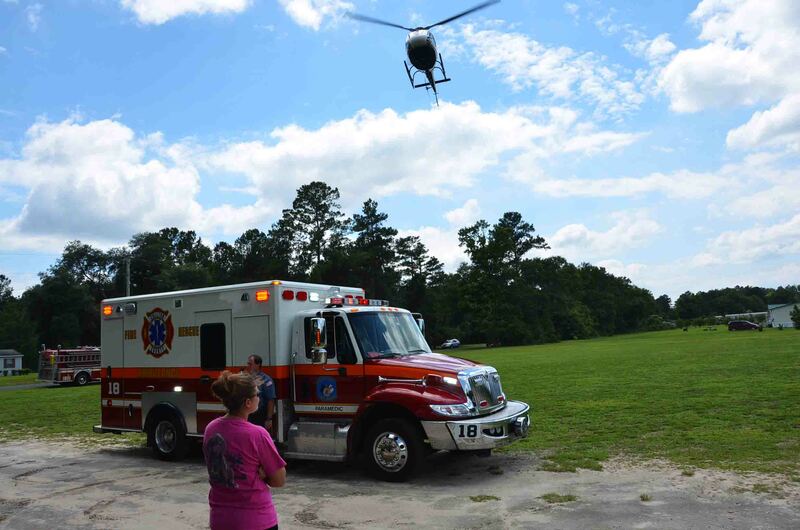 The incident was reported at 18:54 in the 200 block of Confederate Highway north of the Ashton Community, after the small car lost control in a curve, struck the embankment at a small creek and became airborne. The car then struck several trees causing heavy damage to the automobile. Click here for more info. A large pot of food left cooking caused a fire in the kitchen at Leon’s Club located at 3150 Round O Road Friday afternoon 21-June at 17:26. A neighbor reporting seeing smoke coming from the roof of the establishment. Engine 9 arrived to find light smoke coming from the eaves of the one story block nightclub. 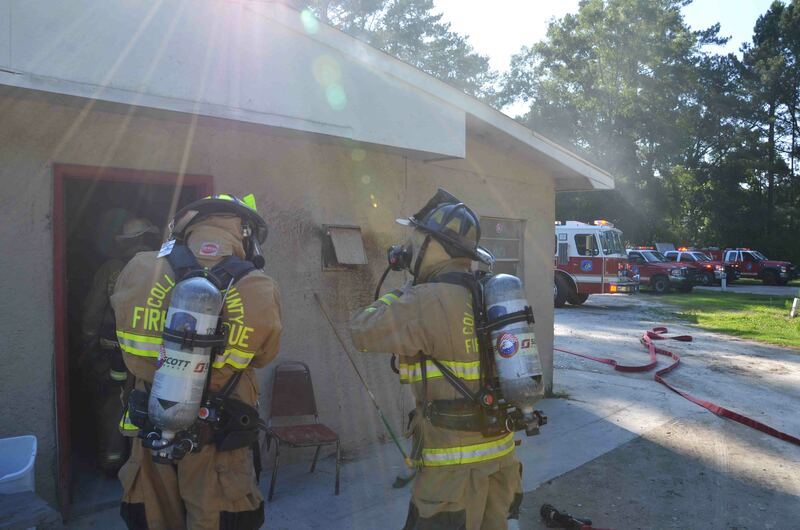 Firefighters deployed one 1-3/4 handline to the back door, then forced entry... click here for more info. Quick actions by the homeowner prevented heavy damage to the home at 130 Andrew Lane Friday afternoon 21-June. At 12:25 Fire-Rescue was notified of a structure fire at this location by a neighbor. Engine 17 arrived to find light smoke coming the doublewide mobile home. 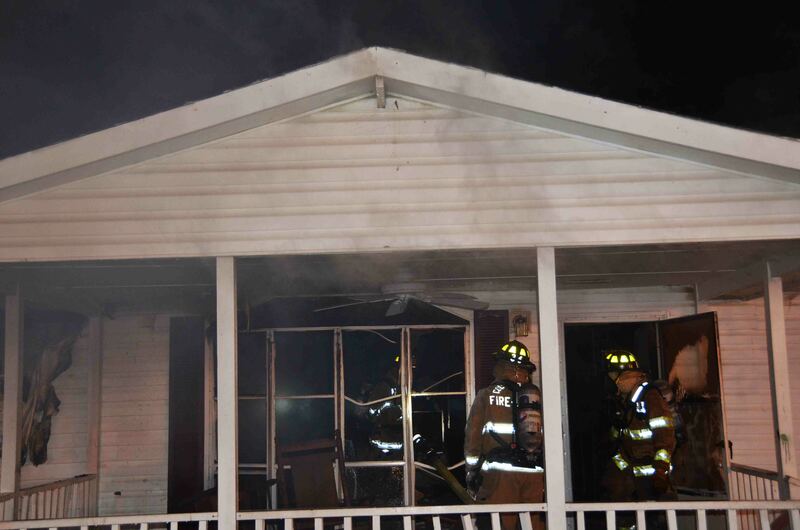 Firefighters deployed one 1-3/4 handline, but the homeowner had extinguished most of the fire... click here for additional information. Family members found an 85 year old female who was suspected of falling from a porch at her residence in the 700 block of Bethel Road Thursday afternoon 20-June at 14:38. Medic 18’s crew evaluated the patient and due to several issues determined she need to be treated at the Medical University in Charleston. Click here for additional information. A kitchen fire damaged a residence at 33 Beasley Street Tuesday evening 19-June. Firefighters were notified of the fire at 19:37. Engine 19 arrived to find moderate smoke conditions from the eaves with fire venting from the rear of the doublewide mobile home. Crews forced entry through the front door and quickly knocked the flames in the kitchen with one 1-3/4 handline. Click here for more information. 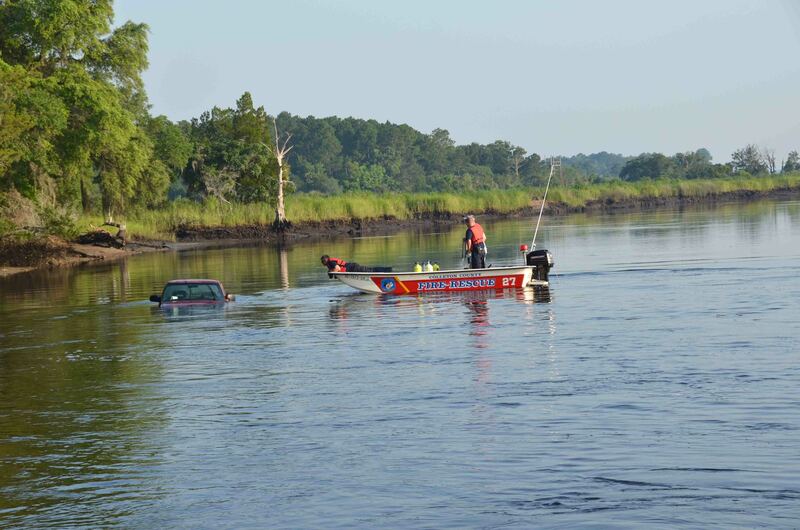 At 07:32 Thursday 13-June, Fire-Rescue was notified of a vehicle submerged in the Combahee River off of ACE Basin Parkway (US Hwy 17) at the County Line. Station 6 and divers responded to the scene. Engine 6 arrived to find a vehicle in the river, partially submerged approximately 100 yards from the Steel Bridge Landing in Beaufort County. Click here for additional information. Visitation for Firefighter-EMT Ed Augustyn’s grandfather, Stefan Motyczka will be Friday 2-4 & 7-9 PM at Silverton Memorial Funeral Home, 2482 Church Rd., Toms River, NJ. Memorial Mass will be held Saturday 9:30 AM at The Catholic Church of the Holy Trinity, 315 First Street, Westfield, NJ. Committal service to follow at Fairview Cemetery, Westfield, NJ. In lieu of flowers, donations can be sent to the Garwood Volunteer Fire Department, 403 South Ave., Garwood, NJ 07027. The Augustyn family thanks everyone for all their prayers and support. 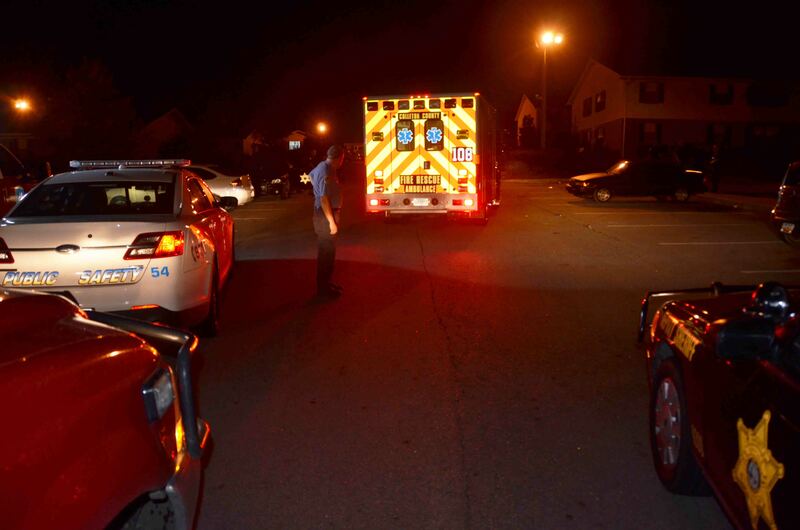 A 42 year old man was left in critical condition following an altercation at 304 Dagger Lane south of the Ashton Community Saturday evening 08-June at 21:17. Law Enforcement and Fire-Rescue were called to the location for a man being unconscious. It was reported that he had been choked until he became unconscious. Click here for additional information. We offer condolences to Firefighter-EMT Ed Augustyn and his family on the death of Ed’s grandfather, Stefan Motyczka, who passed away Thursday 06-June. 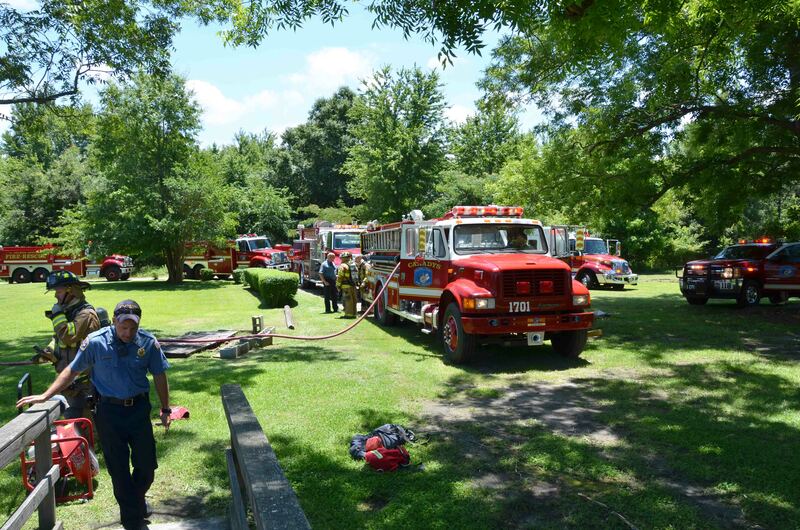 Mr. Motyczka was 76 years old and a 40+ year member of the Garland (NJ) Fire Department. He is survived by four children, eight grandchildren and two great-grandchildren. Funeral arrangements are tentatively set for next weekend. We will provide more information as we receive it. Please remember their family in your prayers. Congratulations to Firefighter/Paramedic Jimmy Guenther and his wife on the birth of their son Owen James Guenther. Owen was born on 6/6/2013 at 01:05 weighing 8 pounds, 11.5 ounces. Both baby and mother are doing well. 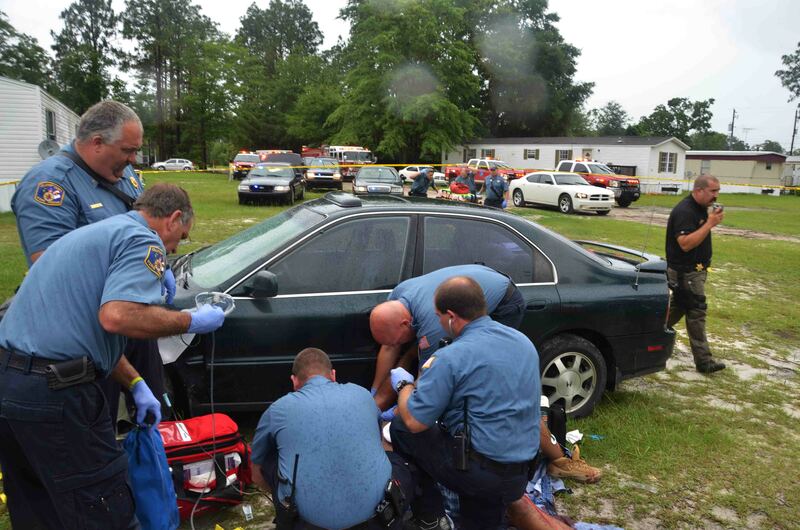 A 32 year old man was shot multiple times at a residence located at 98 Oswald Court north of Walterboro Thursday afternoon 06-June at 16:43. 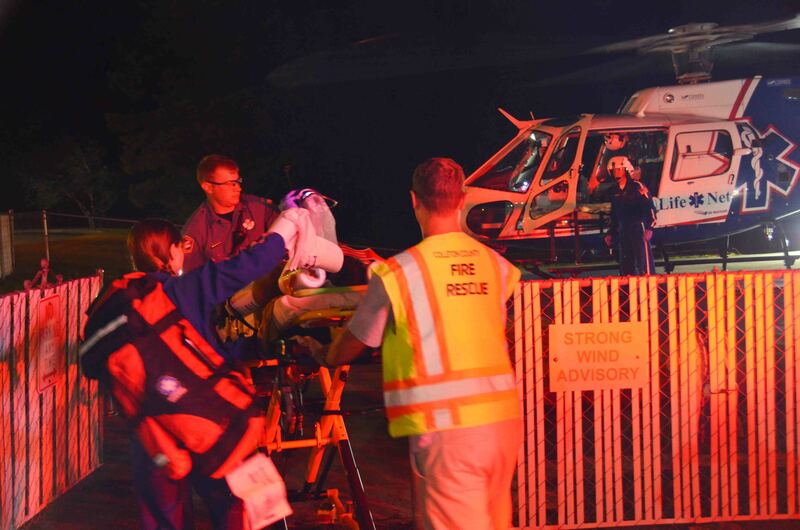 Several Sheriff’s Deputies cleared the scene to allow other personnel to reach the patient. Firefighter-Paramedics found the man lying in the front yard near a car. Click here for additional information. 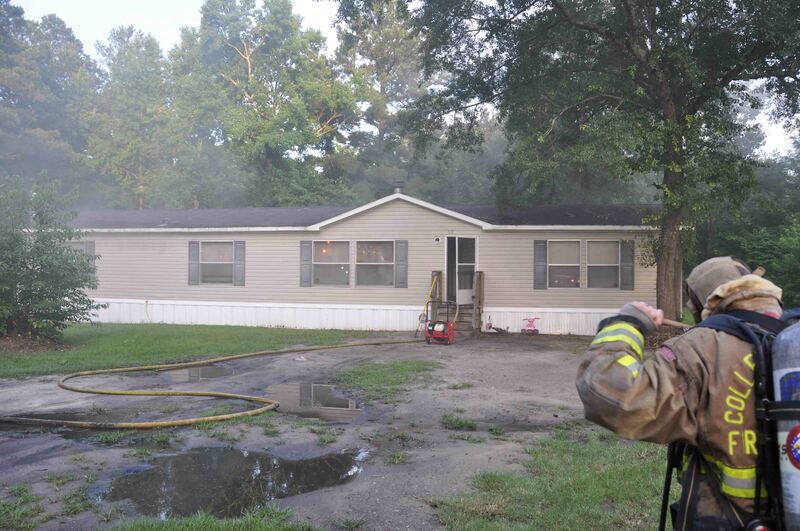 Firefighters were dispatched to 541 Bee Drive Monday morning 03-June at 04:44 for a residential dwelling fire. Engine 19 arrived to find the doublewide mobile home approximately 50% involved with heavy fire and smoke visible. Engine 19 used a deck gun to knock down the heavy flames, then deployed one 2-1/2 hand line and two 1-3/4 hand lines to extinguish the fire. Click here for additional information. 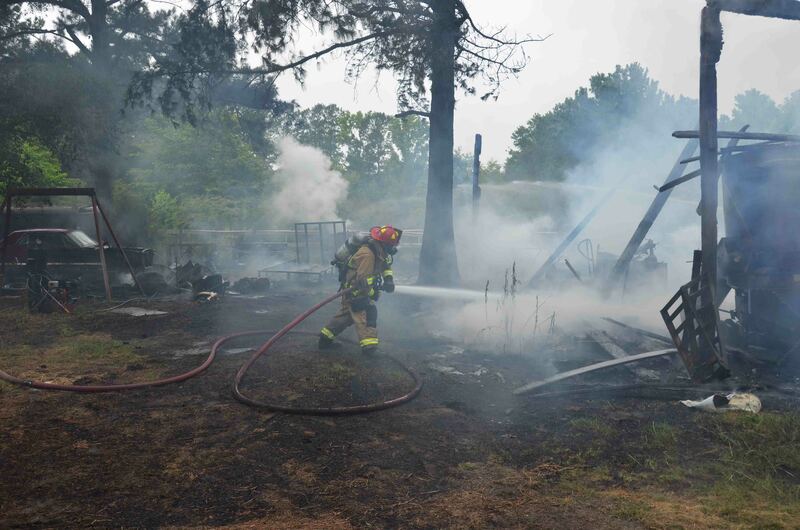 A large barn was destroyed in an afternoon fire Sunday 02-June. At 16:44 Fire-Rescue was notified of the incident at 570 Rebel Lane north of Cottageville. Engine 9 arrived to find the large wooden structure had already collapsed. Several pieces of farming machinery, tractors, a pickup truck, a 1966 Ford Mustang and a large amount of baled hay was also on fire. Click here for additional information. 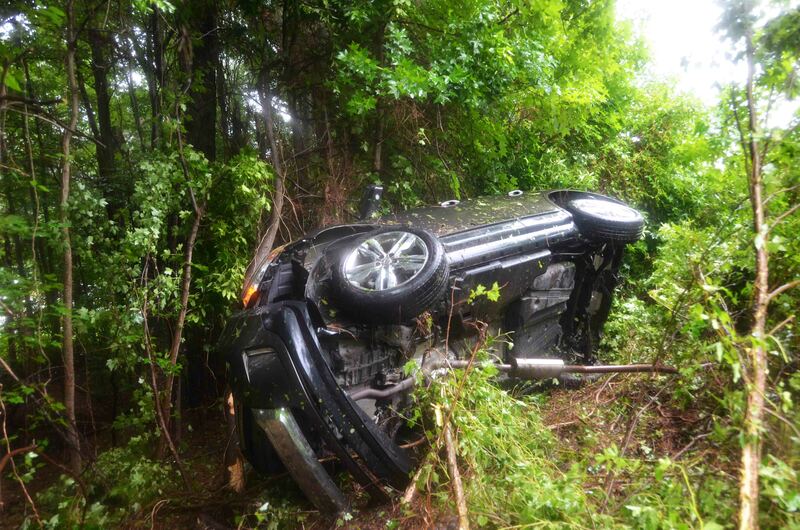 A motor vehicle collision occurred at the 67 mile marker Interstate 95 northbound on Sunday, June 2, 2013. The call was dispatched at 04:14 and indicated that the bus was carrying at least 50 people and the bus driver was trapped. 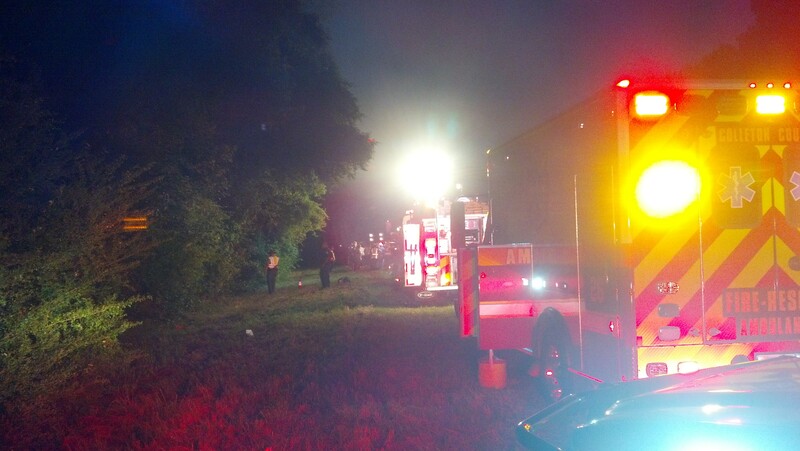 Engine 26 and Medic 26 arrived to find a charter bus more than fifty feet off the roadway in the trees. Click here for more information.